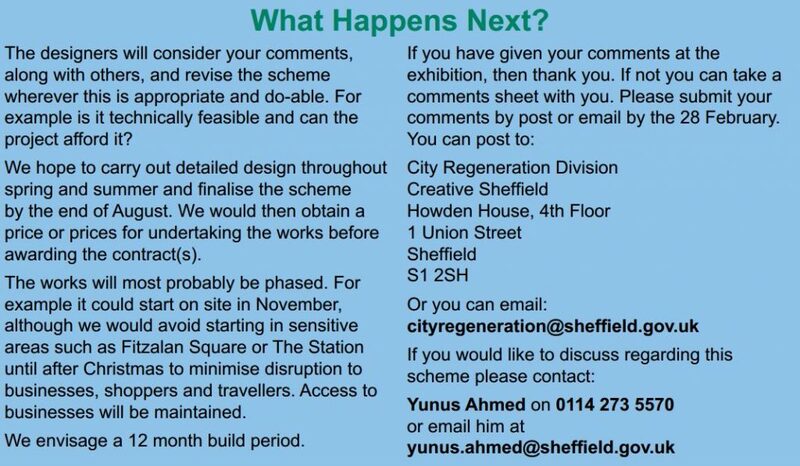 Sheffield Council are “consulting” on a major public realm redevelopment (Knowledge Gateway) in the City Centre, they’ve made it very difficult to respond by hiding the details of how to respond in a pdf, in a zip file, under the business section, of the local tourist information website. Official Sheffield Council consultation portal. Didn’t publish a consultation, or list that a consultation is ongoing. Sheffield Council: Published a press release about the scheme on official press release page. No way of participating is provided other than attending an exhibition. Doesn’t include any drawings or detail. Doesn’t link to any drawings or detail. Doesn’t list a consultation closing date. Provided a link to the Sheffield City Region website with the exact same information. Sheffield City Region: Published a news item on their website. Everything above applies, no further information! Straight copy paste. Created a page under the ‘Developments in Sheffield’ page, under the ‘Business Sheffield’ section for the consultation. Include 8 PDFs in the zip file, some of which are layout drawings, some of which are exhibition panels. In the final pdf, include details on how to respond to the consultation including the closing date. Include an email address and postal address for responses. Don’t publish a comments form. Copies were only available at the city centre exhibition. Hidden on a tourist information website, under the business section, within a zip file, in a pdf. A masterclass in suppressing consultation responses by making it difficult to respond. This entry was posted in Uncategorized on February 27, 2017 by Matt. Just remembered that I’d sent this email a few months ago, no reply. It’s about Traffic Regulation Order consultations. My understanding is that at the moment you need to be on a special mailing list, live in the area, or know about the consultation via some other means to find out about and ultimately see what the consultation is about and the proposals. For instance, I know that there is a TRO consultation ongoing for the Charter Square redevelopment because someone mentioned it to me, however I have no idea how to go about seeing the consultation documents other than walking down to the street and looking at notices on lamp posts, or perhaps asking at the town hall information desk! 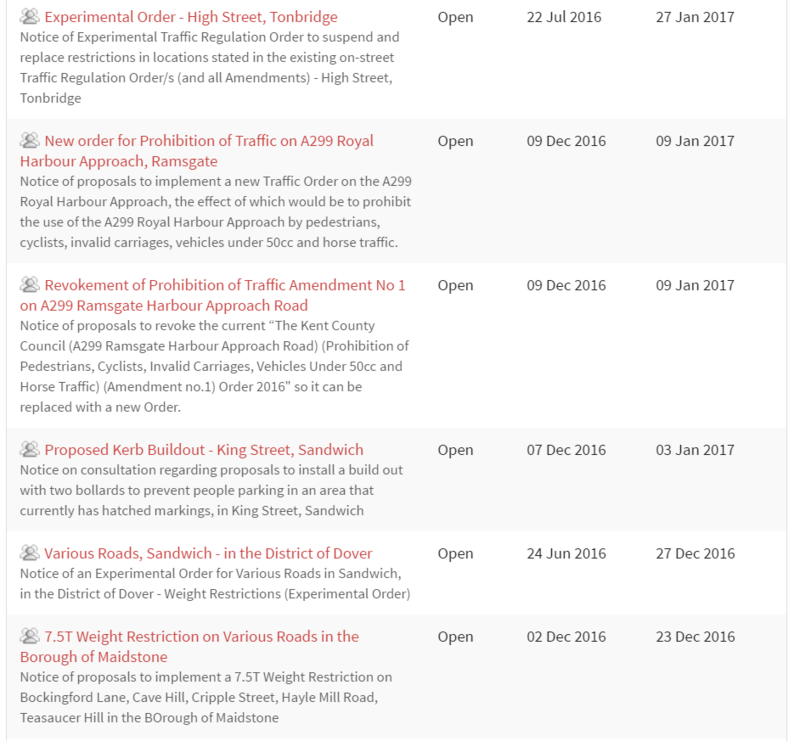 In Kent, they publish all of their consultations on their consultation website (screenshot below), I think it’d be great for accountability, transparency and public engagement if you did the same.